Domus Quiritum Elite is an apartment composed of a bedroom with queen-sized bed, a living room with balcony, a kitchen and a bathroom – all with terra cotta flooring and a gorgeous exposed wood beam ceiling. It is located on the third floor of a historic building from the 1800s (with elevator) in the heart of Rome’s historic center. The spacious living room, with antique furniture, a large fireplace (for decoration only), original paintings and many, many books will make you feel like you’re stepping back in time – the perfect place to spend a rainy day at home enjoying a good book. The bedroom has hypoallergenic, ergonomic and breathable Memory Foam mattress and pillows, and a “planetarium” to provide you with unforgettable romantic nights under a starry sky. The apartment is equipped with washing machine, air- conditioning and Wi-Fi. We also provide linens and towels, hair dryer and iron. Locally sourced cookies, jams, cakes, fruit juices and honey are available for breakfast or afternoon tea. 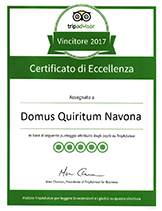 Domus Quiritum Elite is located in the heart of Rome’s historic center, in the Campo dei Fiori neighborhood. Campo dei Fiori (the famous square with an open-air market) is just a 2-minute walk from the apartment, crossing the picturesque Regola neighborhood, while you can reach St. Peter’s in 15 minutes. It’s also an easy walk to Piazza Navona (less than 500 meters), the charming Trastevere neighborhood (less than 600 meters) and Castel Sant’Angelo (less than 800 meters). The closest bus stop is less than 5 minutes away, making it easy to get to Termini station.